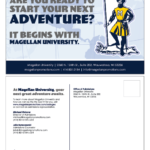 After exploring the PPAI Expo’s tradeshow floor in early January, the Magellan Promotions team came back with many great ideas that we’d love help you incorporate into your promotional product offering for 2017. Check out our favorite products for colleges below. For pricing on any of these items, either click the item name, or visit our showroom. Have you ever held an outdoor event on a hot day where everyone is using your brochures as fans to keep themselves cool? Thanks to the cell phone fan, your event attendees can actually read those brochures instead of waving them around! The fan attaches to smart phones using the charging port and once plugged in can run up to 10 hours. With attachments for both Apple and Android phones, it’s usable by almost everyone. 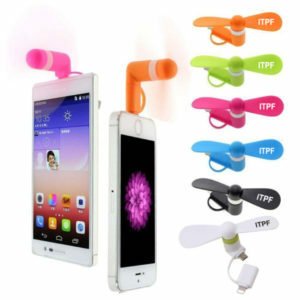 The cell phone fan is the perfect, budget-friendly summer event giveaway. On a hot day, your event attendees will definitely thank you for thinking of their comfort! Plus, the small size means it’s easy to throw in a purse or backpack for easy access after your event has ended. Any time your recipient wishes there was a breeze on a stiflingly hot day, they’ll be glad to have the cell phone fan around! Find more information and pricing here. The econscious brand makes organic and sustainable apparel out of organic cottons and recycled polyester that is durable, comfortable and stylish. 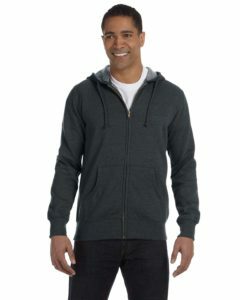 Our favorite piece from the brand is their full-zip hoodie that is made from 80% organic cotton and 20% recycled polyester and comes in six different colors. Over the years we have seen our college partners becoming more and more environmentally aware, and we know that it is important to have apparel options that are eco-friendly. We love this piece because it is comfortable, stylish, and eco-friendly all at once! If you are looking to make a statement in both style and on the environment with your apparel, the econscious hoodie is the way to go. We know just how hard it can be at times to find a bag you like in your schools colors if the colors are anything other than black, white, red or royal blue. This tote bag is the solution you’ve been looking for. Pick from a selection of fourteen different colors for the front and back panels, side gussets, handles and your logo. Normally you’d expect that a custom bag like this is an overseas project with a 5,000 piece minimum and 90 day production, right? Not this time! Production time is under 10 working days, and you can go as low as 250 pieces. 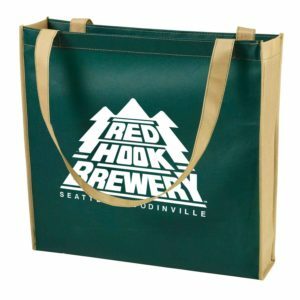 Reusable bags are always a popular giveaway since they can be used so many ways. We’ve been right there with you on project where you want to match a bag your school’s colors, but can’t find the right combination in a stock item, and we know how frustrating it can be when the colors you need just aren’t available. This bag gives you the flexibility to highlight your school’s colors, without requiring you to find the budget for an overseas project or having to figure out where to store thousands of bags you don’t need right away. It’s the perfect custom bag option for any school. The Kanga wallet is a new twist on the traditional phone wallet. Just like the original phone wallet, it attaches to the back of your phone to store credit cards, school IDs and more. But unlike the original, the Kanga is made of faux leather and looks more like the traditional folding wallet, and can hold up to seven cards. It even has a hidden pocket to hide a little bit of cash. For extra security, it also has a strap along the side that ensures that the wallet stays closed. The traditional silicone phone wallet has been popular with many of our clients for years, and we continue to sell it to departments across campus. 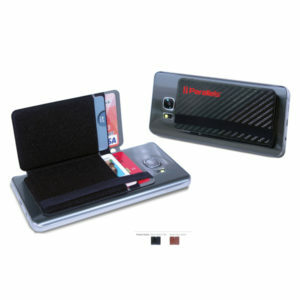 We love the phone wallet – but it does have it’s limitations as it only recommends that you use it to store two cards. The Kanga phone wallet allows you to store up to seven, and it has a more professional look than the colored silicone wallet. It makes for great gifts for staff, or students about to graduate who are looking for their fist job. If you’ve ever had the chance to visit the Magellan Promotions headquarters, you’ll probably notice that we all have a Contigo tumbler or water bottle on our desks. 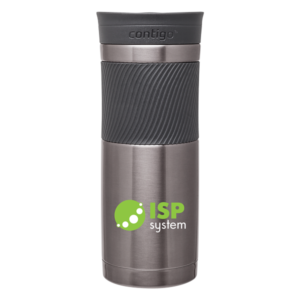 When it comes to a high-quality, retail-name brand piece of drinkware, it’s hard to find something that will be better than the Contigo brand. In 2016, the Congito Byron was introduced as an alternative to the Contigo Westloop as a less-expensive but still high-quality tumbler. The Byron tumbler is a double-wall, vacuum insulated tumbler with a SNAPSEAL lid, meaning that when the lid is closed you can throw it in a bag without worrying about it spilling. Trust us, we’ve tried it! This year’s introduction is a 20oz version, meaning that you can hold an extra 25% in the tumbler over the original version. It’s plenty big to satisfy anyone’s daily caffeine addition (we’d hope). Because of their superior quality, the 20oz Byron tumbler makes for a great gift for staff, guest speakers, alumni, donors and more. The value in the Contigo brand name and quality will show that you’re giving a gift of great value, but you won’t break the bank. 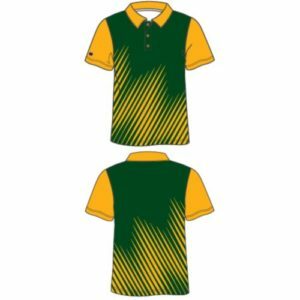 Our custom dye-sublimated polos allow you to fully design a polo from start to scratch with no limit on the number of colors or restrictions on logo placement that you would normally have on a polo with a standard left-chest embroidery. You have the ability to create a design that is completely unique, from design, to color, logo placement and more. With a online creation platform, you can design your apparel from scratch, or start with one of our premade designs. Within 30 days, we can produce and deliver as few as 4 custom shirts to you. Just like with the bags we previously talked about, we know that it can be hard to find a polo that perfectly matches your school’s colors, especially if you are looking for a specific PMS match or want to stand out from the crowd. You can create a piece that no one else on your campus will have. These polos are perfect for helping brand your staff apparel for events, making sure your brand stands out from the crowd. To discuss information and pricing for a custom polo project, please contact one of our Account Managers. We’ve seen knit socks before, and we’ve dye-sublimated socks too. The newest trend to hit our industry is combining the best of both decoration methods – a knit in foot and cuff, with a dye-sublimated ankle. 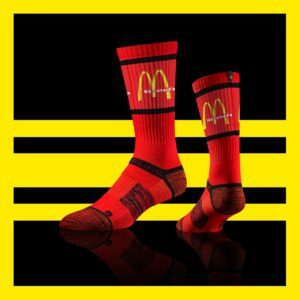 This allows you to get the thicker feeling of knit in the foot of the sock, while getting the extra detail and full-color printing available through dye-sublimation on the ankle. Plus, with new developments in the dye-sublimation process, you no longer have to worry about the white background making your logo from being lost when worn. The new process dyes the threads deeper into the sock, helping maintain the integrity of the logo when worn. You can never have too many socks, right? Plus a good pair of socks can be a little expensive – which is why people will appreciate getting them as a gift. The combination of dye sublimation and knit-in decoration allows you to get really creative with the design and show off your brand in a new, unique way! Socks are great giveaways for fundraisers, athletic events, admissions events and more. Have you ever struggled with getting a wine bottle in your fridge once you put a wine stopper on it because it either doesn’t fit on the shelf or it’s too tall to fit in the door? Many of the wine stoppers in our industry are the taller style that add extra height to a wine bottle making it more difficult to fit in your fridge (but that just means you have to finish the bottle instead of putting it back in the fridge, right?). The Wine-O wine stopper is the solution, as it fits flat on the top of a wine bottle without adding too much height. 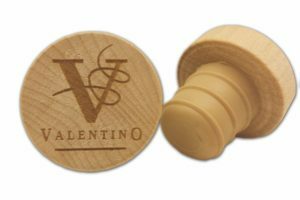 The Wine-O wine stopper eliminates the struggle of trying to get a wine bottle with a stopper into your fridge, while at the same time having a sleek look that is the perfect accent for your logo. Imprinted with either a laser engrave (our favorite) or with UV ink, it is a very sleek gift. Wine-related gifts are always perfect for alumni giveaways and events, or fundraisers. 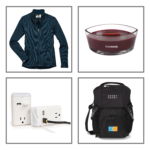 Plus the low minimums and price under $4 means it’s the perfect budget-friendly giveaway. Yeti-style tumblers were one of the most popular drinkware trends in our industry in 2016. But the double-walled, copper vacuum insulation that is used on Yeti-style tumblers means that they can require a bigger budget. The Omega Collection tumbler is a Yeti-style tumbler that won’t break the bank. Instead of the double-walled insulation, the Omega Collection tumbler is a single wall tumbler, cutting the prince almost in half from the double-walled option. The most recognizable thing about the Yeti brand is their look and style, and the Omega Collection tumbler lets you take that style but doesn’t break the bank. It comes in a few unique colors that will make your brand stand out. The straw also makes it easier to drink from, compared to many other Yeti-style tumblers that only have sip-through lids. If you’re looking for a great drinkware piece to use as a giveaway or gift, the Omega Collection is a great option! Over the past year we’ve talked a lot about how the most popular items in our industry are our interpretations of retail brands, but at a less expensive price-point. The Ollie computer backpack is no exception. The Ollie mirrors the look of a Timbuk2 backpack, but at a much lower price point. 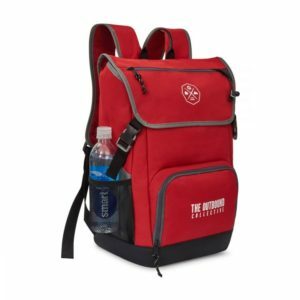 Available in red, blue or black, the Ollie backpack can hold up to a 17″ laptop, and features a zippered accessory pocket, interior mesh pockets for organization, adjustable, padded shoulder straps and more. Backpacks have been trending within the bags category in our industry, and the Ollie is a sharp-looking option that won’t blow your budget. The retail-brand style means that it will appeal to college students, and they’d be happy to wear it around campus promoting your brand. Perfect for scholarship events, admissions giveaways and more, you can’t go wrong with the Ollie computer backpack! Would one or more of these items be perfect for branding your company in 2017? Contact one of our Account Managers or check out our showroom for more information and pricing.